Did you know that some cats have a thing for human ear wax? Its a sort of feline fetish. Odd, I know, but google it if you want and you will find all kinds of stories. Even with all the cats we have had and known in our lives, this was news to me. Our Odin is one such cat. He has been known to walk off with ear buds, take q-tips out of the trash, and most notably, find and chew on foam earplugs. Not good. And I knew it was not good, so, to be careful, I put all foam ear plugs in a closed drawer in my nightstand. Except Odin can open drawers. And so, the very thing I wanted least to happen, tried to guard against happening, happened anyway. He opened the drawer and removed and not only chewed on but actually swallowed and ate an earplug. When did he do this? I cannot say but I suspect it was a few weeks ago. Odin is a big cat for only slightly over a year old. You would even say he is overweight, and can be somewhat lazy. I had noticed recently, that he was becoming more inactive, but then I would see him rally and be more playful, so I just kept an eye on him. But then, he started to leave food in his dish here and there. This was totally not “Odin” and the day he refused to eat at all, I took him to our vet, the lovely Dr. Jessica Harrison at Rose Hill Vet clinic in Rose Hill, Kansas. Odin’s medical adventure lasted a couple of days and at first, even though I suspected exactly what was causing Odin’s distress, x-rays seemed to rule out an obstruction and we were uncertain of what exactly was wrong. To make a fairly long story short, it was soon apparent with additional x-rays, that there was absolutely an obstruction. One perfectly whole and solid orange foam earplug was smack dab inside Odin’s small intestine, his duodenum to be exact. He would have to have abdominal surgery to have it removed. My response to the idea of such major invasive surgery on this little creature that I bottle fed from days old kitten-hood, whom I unabashedly adore (probably beyond what is considered normal for a human toward a cat), was actually completely pure and profound relief. I knew, I just absolutely knew that Odin was going to be perfectly fine as soon as the surgery was scheduled. I felt all the tension completely drain out of my body down through my feet and into the earth. I was elated. “An odd response,” I thought at the time, but it was so palpable and made a big impression upon me. My internal guidance system was just simply thrilled. So to back up a bit, I should state that as Dr. Harrison drew blood and took radiographs, I went into my own kind of action to support Odin. I was allowed to give him hands on reiki at the clinic, I supported that with distance reiki when I was at home, and I also prepared and put into use a CORe (Cellular and Organ Regeneration) process. I was allowed to put an energetically charged quartz crystal in Odin’s cage, a prayer/process was taped to the outside and I wrote CORe supporting number codes on the same paper and also on his IV bag. The surgery was performed on a Friday in the very late afternoon. I arrived just as they were closing up the incision and Dr. Harrison allowed me to sit and be with Odin, and do more reiki as he woke up from anesthesia. From the moment I walked into the clinic the energy was high and joyful. Odin had sailed through surgery and his bowels began visibly working the moment the offending orange foam earplug was removed from the small intestine. He came up out of deep anesthesia in record time and was awake and coherent and purring before I left. The next morning Dr. Harrison arrived at the clinic to find Odin standing purring and meowing at his cage door. He was bright and alert. Whereas most pets take some time to recover and most remain under guarded care three days post op, the most unusual decision was made to send Odin home that morning! This was just over 16 hours after his major abdominal surgery. Please note this is not at all normal procedure. Experience and prudence suggests keeping pets under close observation in a clinic setting quite a bit longer after such surgery. But Odin was recovering so quickly, and as it was the weekend, and Dr. Harrison knew I would be at home and watching him very carefully, and literally not leaving his side, so we decided to let him come home. He was cut from “stem to stern” for this operation, his whole abdominal cavity was exposed. Jessica cautioned me to watch for signs of infection and instructed me to bring him back to the clinic to have his stitches removed in about two weeks. I re-wrote his supporting number codes to address the surgical procedure and affixed those to his “e-collar” and continued giving him reiki energy healing. Odin 3 days after surgery. 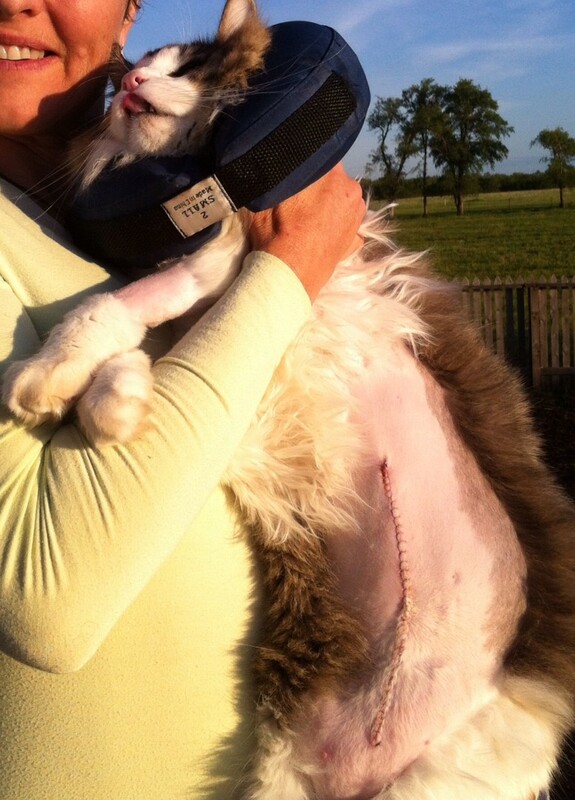 Odin’s speedy recovery continued. As it happened, Jessica was scheduled to come out to our farm about a week later to do routine dental care for the horses and to check on some of the other pets in the house. I was looking forward to seeing what she had to say about Odin’s continued recovery and incision healing. To say that Jessica was surprised when she first looked at Odin’s belly was an understatement. I knew he was healing fast, but I did not know how fast until she examined him closely. She said the stitches were ready to be removed…immediately! She also said that the earliest she had ever even heard of stitches being removed from abdominal surgery of this kind was 10 days post op. It wasn’t even quite a full 8 days when she started to cut and remove the stitches. It was closer to 7 and a half days. As a matter of fact, so much hair had already began to grow, it was growing over the sutures and made the removal a bit difficult. She said it looked like it had been healing 14 days or longer, from its appearance. 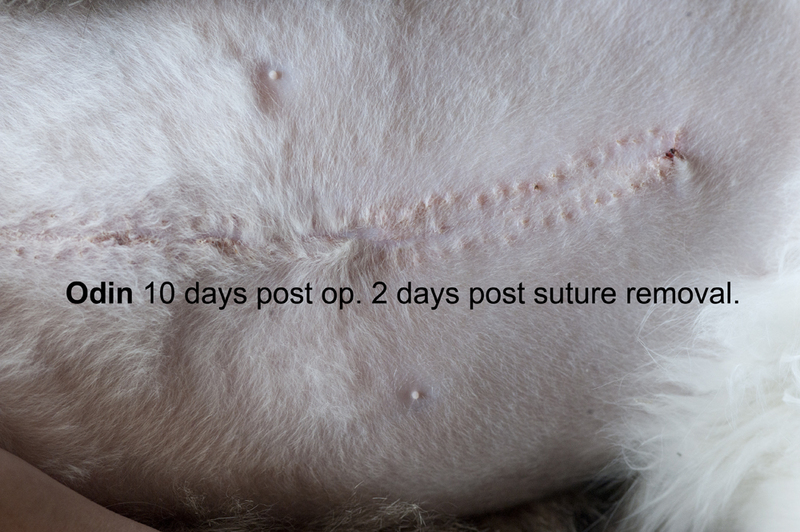 I took a couple of close up photos 2 and 6 days after suture removal. 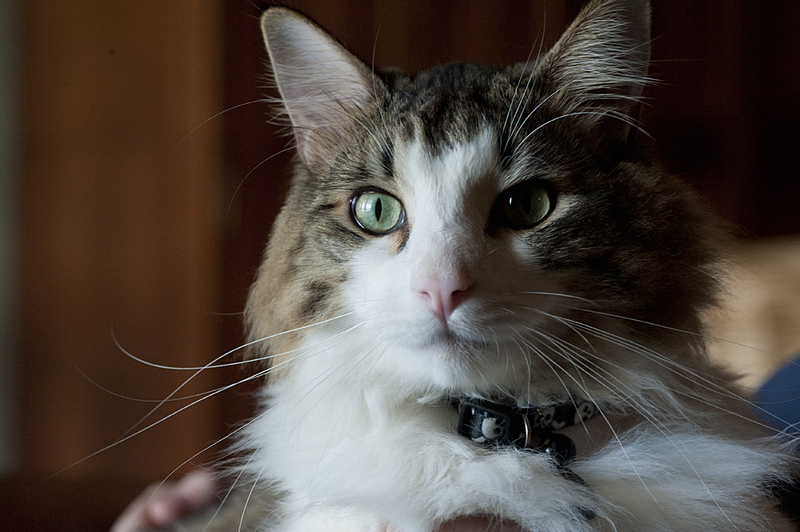 These photos show Odin’s remarkably fast and “picture perfect” healing. When these kinds of things happen, I find myself pondering the reasons why, the lessons to be learned, the connections to be made. I find myself thinking that perhaps much has to do with the fact that 3 very traditionally trained veterinarians, one vet-to-be, and an office staff got to see reiki and CORe in action and see it make a real, and most positive healing contribution to conventional veterinary medicine. This entry was posted in Animals, CORe Healing, Energy Healing, Reiki. Bookmark the permalink. I am so glad Odin is doing well. I know the CORe and Reiki have an incredible affect on the body, mind and spirit. When I was recently going through my surgical issues, I found a copy of the prayer you sent me to use when we did a CORe session. When my surgeon removed my stitches he said he had never seen anyone heal so quickly. I said the CORe prayer every morning and every evening without fail, before and after the surgery. I am still doing it. Of course, I had a lot of people praying for me, and I know it all works together. 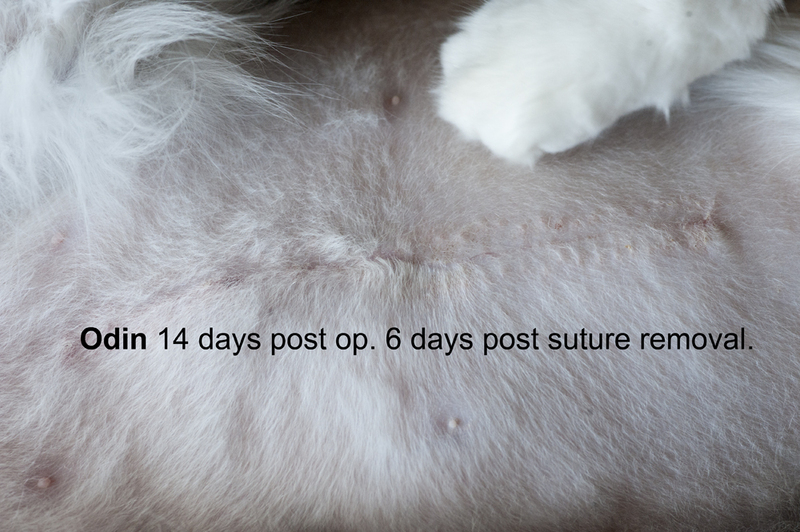 People who have seen the scar have told me it is hard to believe it has been less than a month since the surgery. I know spiritual healing works! Well what a wonderful gift! I am so very pleased about your surgical I outcome Joy. Nice to know you are still doing it too, I am sure it is a help in your life and world. You are such a dear….Miss you! I think of you often. Perhaps we will see each other soon. It would be wonderful. Hooray for Odin! Happy to hear he is doing much better. Thanks for sharing the story. I recently sliced off part of my finger nail reaching into my travel bag and unknowingly raking my finger nail across my razor. Could have been worse basically just sliced off a big corner of my nail, didn’t go too deep. Lots of blood of course and some pain. Day and a half of Reiki and the pain was gone and my finger well on its way to healing. Thanks for sharing this wonderful gift with me Candace. I hope to continue to learn and be able to share this with others. Hi Mark, good work, good news and you are so very welcome of course. So happy to hear you are continuing to use reiki in your life and world. The ranch is HOPPING, how about you and your sweet boys come out for a visit sometime!? That would be a big ole pack of dogs! What a fascinating and uplifting story of healing!! Aw, thanks for stopping by and the nice comment Helga. See you really soon!